The tragic death of a young man named Tyler Kahle has transformed care at Methodist Hospital. After coming to us for treatment, Tyler died from an undetected rupture inside his chest, a tearing of the aorta called thoracic aortic dissection. He was just 19. Methodist Health System is working to raise awareness and help health care providers understand and act on the knowledge that aortic dissection can occur at any age. 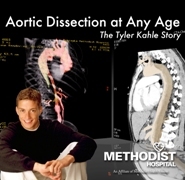 The video “Aortic Dissection at Any Age: The Tyler Kahle Story,” produced with the help of Tyler's family, offers lifesaving information for medical professionals and the general public. Methodist and Tyler's family continue to advocate for lifesaving change through membership in the TAD Coalition. Learn more about our commitment to prevent aortic dissection deaths. After Tyler Kahle’s death, Methodist implemented a three-question bundle, requiring just a minute or two of a care provider’s time, to identify chest pain patients with the highest pretest probability of aortic dissection. Then in 2010, the American Heart Association and the American College of Cardiology announced the release of clinical “Guidelines for the Diagnosis and Management of Patients with Thoracic Aortic Disease.” Learn More about our recommendations for health care providers on diagnosing aortic dissection.